I was so excited to get a few minutes of Pompous Albert’s time to get to know this handsome fella a little better. The internet has given him all the likes (96,000 Instagram followers!) 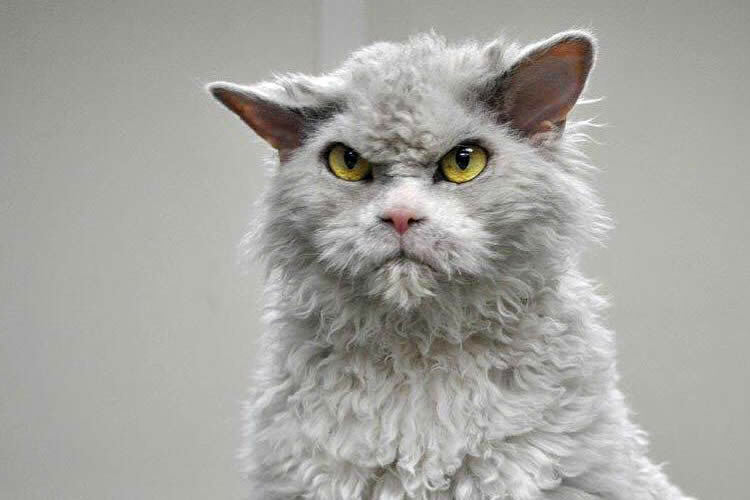 making him probably the most famous Selkirk Rex ever! With his unique curly fur and piercing eyes, he is one captivating cat and, yes, I am a total fanpup. Sully: Thank you so much for taking the time to chat with me today. Let’s get started – I think I look like George Clooney! What human celebrity do you look like? 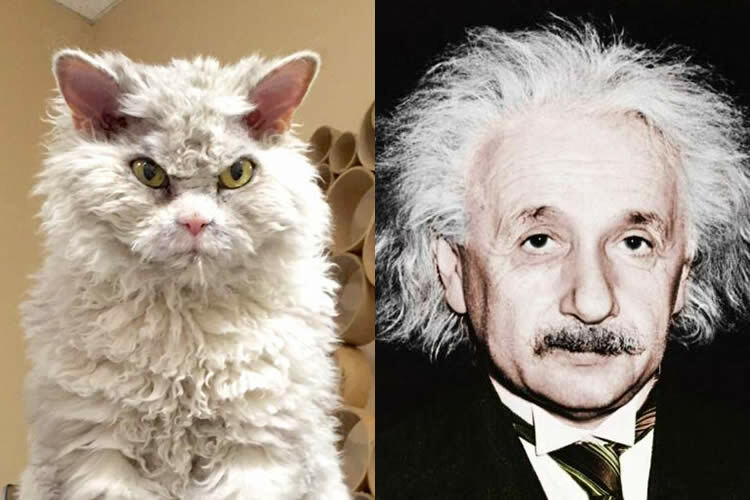 Pompous Albert: Albert Einstein, because he’s brilliant & wild. Sully: What are your humans like? Pompous Albert: They are all very cool & loving, especially when they appease my treat requests. Sully: I love to chase my cat bro, Murphy. Do you have other fur faces in your house that you play with? Pompous Albert: Well, I’m an office cat and I live with Lucky (thusly named after being found in our dumpster) & Buddy, a rescue. They are my sidekicks. Pompous Albert: I prefer to sleep on my human’s keyboards, mouse pads, or directly in the way of their monitors. Although, I do have several cat towers and a kitty mansion. Pompous Albert: TV and movies interfere with my naps, but I do like to see what everyone has on their monitors throughout the day. You know, in case it’s not approved. Pompous Albert: Human job? That’s easy, a brain surgeon so I could trip the ” treat switch” in all human brains to “on” permanently. Pompous Albert: If I had a magic wand, I would wish for all my feline friends to be adopted or rescued like me and my fellow office felines. Sully: What kind of music do you like to listen to when the humans are out? Pompous Albert: I’ve grown to love all music genres since the employees are all ages here. But, the bubbling sound of a fish tank, squirrels, or birds is interesting since I don’t go outside. Pompous Albert: I like the ones designed for us felines to watch. I find them interesting – for a while. Wrooooof! I was rescued from Noah’s Bark Rescue. I’m originally from South Central L.A. where I was found in a box in a parking lot with my littermates. Straight outta Compton! Nowadays, I spend my time napping and working on Sullyburger.com and get to interview awesome anipals like Pompous Albert!